of earthly genesis. Life from light. your parents, leaving you a thing divided. that eventually solved to you. the husk of a star, its bright wick extinguished. brown pants with their tired, elastic waist. Forgive us. We forgot your shoes. that climbed the stack & glowed a moment. A fistful of stars against the darkening sky. dress pooled above your waist. creature of fire and smoke and air. the sun in the purple flesh of a freshly plucked grape. his mistress and later his secret bride. like bloody water around her wasted shoulders. the god who hides behind two doors of beaten gold. what matters is beyond the reach of mere decay. holding a first thought which was long ago their last. in a love that finally saved them only from themselves. their impossible plunder of sunlight. and wood became one seamless note upon another. where cancer’s taproot feeds its deadly flower. Frank Paino's poems have appeared in a variety of literary publications, including: Gettysburg Review; The Journal, Iowa Review, The Antioch Review, Kenyon Review, Poetry Northwest and the anthology, The Face of Poetry. Recent work appears in Hunger Mountain, Catamaran and Ekphrasis. Other poems are soon to be published by Lake Effect. His first two volumes of poetry were published by Cleveland State University Press: The Rapture of Matter (1991) and Out of Eden (1997). 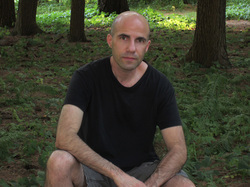 He has received a Pushcart Prize and The Cleveland Arts Prize in Literature. He recently completed his third manuscript.